To begin, enter your group name in the Group Name field, then click ✔ to save the group name. Add User to Group - This will open your list of users, where you’ll be able to handpick the users you'd like to assign to this group. Remove User From Group - You can remove a single user with this button. Manage User Settings - This allows you to edit a single user's settings from within the group. 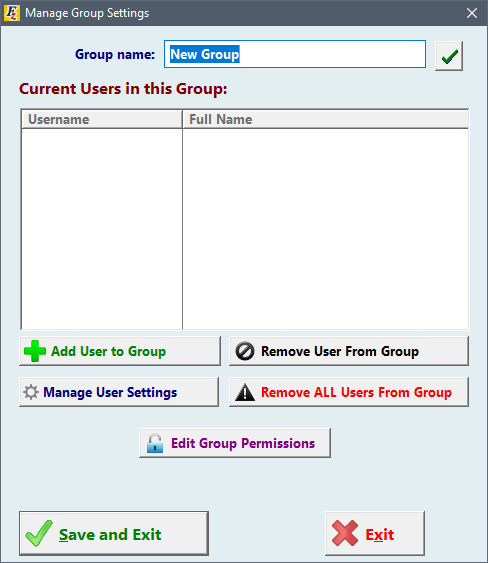 Remove ALL Users From Group - Use this to remove all users from the group with a single click. Edit Group Permissions - This button allows you to modify the permissions for the entire group. When done with your new group, click Save and Exit.